Important categories worth seeing is here for you to have the best shopping experience now. 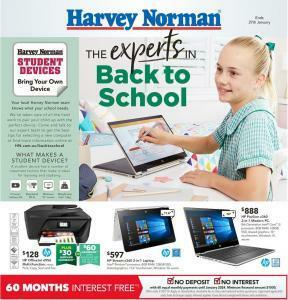 Harvey Norman Back To School Jan 2019 Catalogue makes it easy for you to choose the best electronics for your child before school started. You can find high quality, affordable and the best practical printer, Laptop, PC, Tablet or the phone in this catalogue. Also, check gaming monitors to is the best gaming experience. Also, cameras for beginners or masters are premium quality. Let's see some picks from the best brands including Acer, Asus, Lenovo, and HP. Harvey Norman Back To School Jan 2019 catalogue offers you a wide range of products related to decoration.If you want to do a better job, your study room has to be decorated with your style. As a result, you prefer whether minimalist or maximalist way of decoration, best quality items are waiting for you in Harvey Norman Back To School Jan 2019 catalogue. Also when you spend $199,00 on office furniture you can get %25 off on any office chair. Some of the furniture picks are below. Furniture items are not available to purchase online so go to nearest Harvey Norman store where furniture purchase is available. Finally, you can find all electronic products suitable for all budgets. For example, Nokia 3310 3G phone costs $69 and Iphone XS Max costs $17799. Harvey Norman tenders you affordable and luxury items together in this catalogue.